Ellie sits in the darkness by the decorated tree, where faint shadows ebb and glow on the walls opposite the candles on the fireplace mantel. The lunar eclipse—an astral event that happens every 500 years or so on Winter Solstice, is in full swing, and the full moon’s light, once fighting through clouds in the bay window behind her, is now giving way to the dark, orange shadow of the Earth. Of course I understand that you can’t make it back before Christmas. We’re all very busy. Ellie is dressed in flannel pajamas, and she practically disappears in the tag blanket draped over her shoulders and pulled tightly under her chin. The electricity has been out for more than five hours, since just before sunset. Sub-freezing temperatures outside are slowly stealing the heat from their house, and her father, who now stands just outside the open front door, is not doing much to preserve what little warmth remains in their split-level home. They’ve been saying since Monday that she won’t make it through the night. It’s not like she hasn’t known that you’ve been here every night since. I don’t know. Mom always did do things on her terms, didn’t she? Monday had been three days ago. Ellie, just 9 years old, couldn’t understand how grown ups knew such things about dying. She worried that, one day, her dad might say something like that about her mom or, worse, about herself. Tonight just feels different, though. The eclipse happening—on Winter Solstice no less—just seems a little, I don’t know—ominous maybe? Ellie overhears her uncle mentioning the transformer fire, too. Exactly. I just feel like the stillness is preparing all of us for the inevitable. . . .
Ellie studies the decorated tree in the darkness; once-illumined ornaments now stretch from the shadows seeking some remaining light to get their shine on. But they are frozen in the near-darkness, too, an orange-reddish hue in each of them. She shifts her legs in front of her, scooting them under the tree skirt that, in just a few short nights, will be invisible from the mounds of presents under the tree. She almost prefers the subtle sanctity of this quiet moment to the chaos Christmas morning will bring. Yes, yes. I have your new cell number. You will be the first I call if anything changes. There is silence as they exchange hugs, some tears. The front door closes, and Ellie’s dad joins her at the tree. He is wiping his eyes. “The cold will do strange things to you, Ellie.” When he dabs the corners of his eyes a second time, he looks down at Ellie and stops, as if really noticing her sitting in the dark, a bundle of blanket staring blankly at the dark tree. He sits down next to her and faces the tree. Together they are silent, but both feel a certain understanding and comfort in the silence. This is the way it has always been between them. Ellie looks at her dad and rolls her eyes. Sometimes, she thinks, he just doesn’t understand her at all. She looks back at the tree and imagines the gifts placed with purpose atop the red-plaid tree skirt. Grams was always concerned as much with how they looked and where they were placed, as she was about what was inside each of them. Ellie considers getting her presents to everyone from her room and putting them out tomorrow morning. It might make everybody feel a little better, she thinks, even if they know it’s only her gifts and not Grams’. He nods his head and closes his eyes, but he’s too late. The tears find their way again down his cheeks anyway. Ellie doesn’t answer immediately. She is suddenly too busy thinking about whether she will cry when Grams dies. He looks over his shoulder and up the steps to the door, partially closed. There is commotion, but nothing alarming. Maybe she’s just thirsty, he thinks. Or she needs to be changed. That’s probably it. He turns back to the dark tree and tries to find an old ornament of a robin’s nest that he made when he was Ellie’s age. Ellie pulls the blanket over her chin and scoots herself a little closer to her dad. They sit for another minute in the chilly room, staring at the ornaments on the tree. Icicles, pine cones, teddy bears, and angels. No little nest. Their silence is broken by the raspy breathing that seeps from the partially opened door just up the stairs behind them, a little to the right. Ellie stands, but she casts no shadow on the tree or anywhere else in the dark room. The candles on the mantel are cold, and the eclipse is at its peak just as the moment Winter Solstice arrives. For these next few minutes, her world stands still, an absence of light, shadow, and form. At first, it terrifies her that her dad is no longer next to her. She must have nodded off though, and she now vaguely remembers him getting up to check in with Grams. A kiss on the top of the head, cluttered with a fragmented “I love you,” and he was gone. She looks out the window and notices the wind, bending the branches of young saplings they planted months ago. They are so flexible and refuse to succumb to the push and the pull of the shadow-less wind that roars by. As if in harmony, she hears a voice upstairs—more like an intentional hum—sync with the wind, a quiet meditation that lures her up the stairs. It is coming from Grams’ room. The hum continues from inside, and she places her cold hand on the brass handle and gives it a twist. With a gentle push, she feels the warmth and smells the subtle scents of vanilla and primrose as they both brush over her. Light from candles falls on the walls, her own face, as she whispers again. The humming stops as Ellie steps in. She looks around Grams’ bed and notices the flowers and the candles that surround her. Only the ones from Uncle Jim, sitting on her night table, are new; the others arrived on Monday when everyone assumed that it was soon going to end. At the foot of her bed, just by the now-dark window, is the hospice nurse, Fran. She is sound asleep in one of the two Victorian chairs Grams demanded to have in the room with her. The other chair, empty, is at the front of her bed. Have a seat close to me, Eleanor. I want to talk with you. “Of course, Grams.” Ellie sits, and when Grams lifts her hand toward her, she immediately takes it in her own and rests them on the bed. She can feel her grandmother’s pulse, slow but present, through the pale-skinned fingers. Your dad tells me you want your gifts. I know what you mean, Eleanor. I always have. I was just like you when I was your age. Ellie, relieved, looks closely at Grams and struggles to find a resemblance between them. Since she can remember, both her own Dad and her uncle Jim have told her how much she looks like Grams. Yes, I’m afraid it must run in our family. It doesn’t mean he doesn’t love you, though. “Oh, I know that. He just doesn’t get it all the time, you know? I do know. Most dads struggle a bit in the beginning. He’ll get better at it as you get older, though. Trust me on this one, Eleanor. His love for you will guide him along the way. An uncomfortable silence passes. Ellie listens for the roar of the wind outside, but hears nothing. There is no breeze in this room, and the candles don’t dance; they stand still, as if in meditation. Eleanor, I need to tell you something. Ellie leans in and rests her head next to Grams’ on the pillow and begins to cry. Ellie could feel her grandmother’s hand squeeze gently. Do you remember what you said to your father about why you wanted those presents under the tree? That’s right. Did I ever tell you about my grandmother and what she would do for us on Christmas? That is all true, Eleanor. Sometimes, your great-grandfather struggled just like your own dad does now. Another period of silence, but Ellie does not care. She feels a certain peace and comfort that she has only heard about in church. Now your great, great grandmother, Grandmère, I felt as close to her as I think you feel to me. When I was your age, a long, long time ago, she would wrap her presents for us days before Christmas—yes, they were wrapped in gold paper, just like mine are, and we would always put them under our tree and try to guess what she had made for us. We made everything for Christmas in those days—the decorations, cookies, even the ornaments on the tree. Exactly. I think that’s why your dad is looking so hard for that little bird’s nest right now. Yes. The two of us made that together when he was a little boy. Funny how we hold on to memories like that. I’m sure he will. You know your father; a little forgetful at times, but his heart is always in the right place. He most certainly does, Eleanor. For a long time they sit in silence. Ellie begins to fall asleep in the oversized Victorian chair, her hand in Grams’, her head on the pillow. Eleanor, we’re almost done. There’s just one more thing I want you to know. I’m afraid it can’t, Eleanor. We live on in our traditions, our legacies. The love that my grandmother shared with me when I was your age is still here, in me, just as strong as it was all those years ago. Yes, yes. Like right now. That’s where love resides. It never dies, Eleanor, and it never fails. Even though our time to pass away comes eventually, the love I have given to you has been passed down by my grandmother, and before that, by her grandmother, and so on. That’s what makes love eternal. Love is patient, love is kind. Love bears all things, believes all things. I know, dear. I believe in you, and I love you. Ellie closes her eyes and lets the gentle scents of vanilla and primrose carry her to sleep. As the minutes slip away, she does not feel the subtle easing of Grams’ fingers around her own. The chill that swirls around Ellie awakens her abruptly. It is still night, but hours must have passed. The candles are quiet, dark, and there is a different lingering scent that mingles with the vanilla. Outside the window, she notices a new, subtle pulse of light reflecting on the snow. Ellie stands, walks over to where Fran still sleeps, and peers out. The Earth’s shadow is all but gone from the moon now, and most of its bright-white glow casts new light, new shadows below. The pulsing light Ellie sees, though, seems to be coming from the house itself, from the window just below her. Reds, greens, whites, and blues bring a come-and-go splash of hues across the front yard snow. Ellie, suddenly excited, leaves the window and turns, bumping the nurse’s chair. She runs out of the room and skips down the stairs, stopping abruptly on the bottom step. The electricity is still out, but the room emanates a new warmth. The glow from the moon casts a soft light on the tree, now blinking red, green, white, and blue. Underneath the tree are three presents, wrapped in gold paper. She repeats “Love never fails” several times before opening her eyes, smiling. From the presents wrapped in gold, she follows the string of battery-operated lights as they were draped from the base of the tree. At the top, they form a little resting-place for an old ornament, a handmade nest with two hand-carved robin’s eggs nestled snugly in the bottom of the nest. There is commotion upstairs, and Ellie turns to look as Fran calls for Ellie’s father. He stumbles from his bedroom, still partially asleep, and disappears into Grams’ room. The presents under the tree are arranged perfectly, Ellie thinks. She reads the unsteady writing on the tags on each gift: a rather large, square-shaped box for her father, and next to it is a long, heavy box (surely a robe or winter sweater) for her mom. To the right of their gifts, set subtly apart as if on purpose, is a smaller box, the heaviest of the three. Ellie looks back to the stairs and can smell the scent of vanilla and primrose that slips through the open door and finds its way to her. She doesn’t want to make her father angry if she were to open the gift. Maybe if she delicately opened the corner and slid the present out gently without disturbing the rest of the wrapping. . . .
And that is exactly what she does. Ellie slides her finger along the side flap of gold, unseals the single piece of tape, and unfolds the corners. When she reaches in to slip the gift through the opening, she is surprised at its texture. She feels material, worn in some places, tattered in others; single strings of thread hang from the delicate edges. This is something old, heavy, covered in cloth. With one determined tug, she pulls the present from the paper and holds it firmly in her hands. Ellie, now oblivious to the new sounds coming from the top of the stairs, opens the journal and reads the inscription, written in the same script that is on the front cover. Centered below the inscription is the date. “That’s the day Grams was born,” whispers Ellie. She turns the page and begins reading the first entry. She begins to turn more pages and finds pictures, little works of art, notes shared between them when Grams was a little older. Eventually, though, the time between entries jumps from days, to then weeks. Two months had passed when Grandmère wrote her last entry, and it was dated 16 May 1938. Ellie’s father stands at the top of the stairs and calls her name gently, but she does not hear him. She turns the page and finds a small card taped in the center of the page. Ellie hears her father coming down the steps, slowly. She turns the page and finds a new, more recent card, taped in the center. A birth announcement. who will raise this child with love! She turns the page and sees the first entry of many, written to her, from her Grams. Her father, now behind her, places his hand on his daughter’s shoulder, kneels down, and kisses the top of her head. Ellie closes the book, looks up to her father, and begins to cry. She turns into him as he lifts her into his arms. 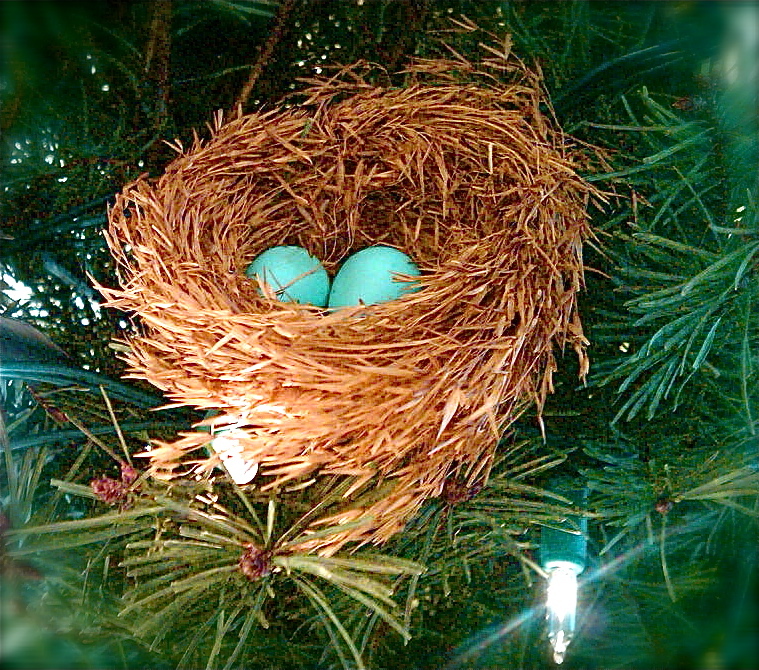 And as he stands, he notices the little robin’s nest with the two hand-carved eggs, resting peacefully on the lights. Rus, Love this! Brought tears to my eyes, as it so reminds me of Grams and our special bond (being the only granddaughter for so many years)…. I miss her so much…I have a special letter she had written to me…the last one I had received..I cherish it with all my heart to this day. It really isn’t about me as much as it is about Abby…One day it will be hers. Reminds me to cherish every minute, even the last few with the ones we love. The last days/minutes I had with Grams are probably my fondest…telling her I love her and hearing her tell me the same…. Visiting a few days later, I found her unresponsive knowing it would be the last time I would see her alive, I recall telling her “Thank you for the honor of allowing me to take care of you…just as you took care of me. You will forever be in my heart Grams, I love you”, as I held her hand, her now thin fingers intertwined with mine, I caressed her pale, gray cheek with my other hand, then finally bent and softly kissed her forehead before leaving as teardrops gently fell from my already red and swollen eyes. They say time heals all wounds….I don’t think so…I still have a hole in my heart where she once filled…now it is filled with emptiness. All I have are memories and a few cherished items to fill the void. Will it every heal? Probably not. Does it get easier? Yes. Just knowing that one day we will be together again in Heaven. RIP Grams…I’ll be there soon enough. Thanks, Wendi…And thank you for the added touch you’ve provided in your comment. I certainly thought of you while I was writing this, and I’m sure you see a lot of references to dates and names that are quite significant. I genuinely appreciate you taking the time to read it, Wendi. I loved reading this, Rus. Sometimes I think I’m leaving my grandgirls too much — not too much information, but just too much writing! The 365 journals entries are shorter, something they might be able to start with. The girls were here for the last 3 days. I have one of my essays the Sun printed about the oldest laminated and on the wall of my office. The middle girl was reading it and asked if I had written anything about her. I opened my spiral binder and showed her two that were inspired by her — she sat there, enchanted, while I read her both of them. One was inspired by her sonogram, which I still have up on my window. I showed her how when the sun comes out, I can see her. Thank you, Barbara…I don’t think we can ever leave too much writing. My mom wrote a ton from 1989 to just a few weeks before she died, and I never tire of opening a journal and reading through the pages. Anyway, I’d rather my kids and grand-kids to-be have too much writing than be in the situation I’m in–clinging to a single letter that my grandfather wrote my mother when she was still a teenager. That’s the only writing I have from any of my grandparents. . . .I wish I had more! Rus, If you ever want copies of the letters I have in the heritage albums please let me know. Bob has all of them scanned in and it wouldn’t be a problem to send them or burn you a disc. I know it isn’t the same as having the originals, but it is still something! I am more than willing to share copies of whatever we have scanned in with you. Just say the word. If you ever want to get together to go through what I have, give me a call!